A conservation biologist has warned that hares are "in crisis" and claims the number dying from a myxomatosis-like illness is rising. Dr Diana Bell, from the University of East Anglia (UEA), said she had been notified of more than 600 deaths in the last six months. "There hasn't been a day since October when I haven't had a report," she said. "Hares are dying. We need to know why." Defra said the population was stable but it continued to monitor numbers. 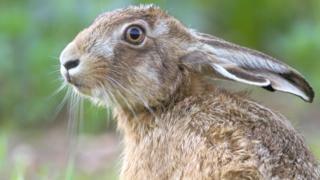 Scientists first identified the hare population was struggling in September, when sick animals were reported in Suffolk. In January, they confirmed that rabbit haemorrhagic disease virus type 2 (RHDV2) had jumped the species barrier to hares, but Dr Bell believes the animals are also being affected by another illness. "This mystery disease which looks like myxomatosis, which I'm told by farmers smells like myxomatosis, but we've yet to confirm [what it is]," she said. Members of the public had described live hares with "ocular symptoms", but Dr Bell said they were not yet represented in carcasses, and tests were ongoing. "One of my colleagues has driven 12,000 miles around the country, collecting bodies," she said. "We've definitely got two different things visibly going on in the dataset." In response, a spokeswoman for the Department for Environment, Food and Rural Affairs said it was aware of and monitoring the situation, but that there were many possible causes for hare deaths including trauma and European Brown Hare Syndrome. A spokeswoman said: "Five hare carcasses in Great Britain have so far been detected with rabbit haemorrhagic disease virus type 2 (RHDV2)." There was no risk to public health, she added. Ben McFarland, from the Suffolk Wildlife Trust, said that, nationally, the hare population declined by about 80% in the last 100 years. "If we don't find out what the cause of these diseases are, it might actually be the final nail in the coffin for hares right across the country," he said. Defra said the brown hare population remained stable, with an estimated population of 579,000 animals. "We will continue to monitor this through Defra's wildlife surveillance network," a spokeswoman said.